Hale Cosmeceuticals Professional Care System offers full-strength anti-aging skin care products for home use. This system comes in both full-size and mini kits. Using these four products together delivers the strongest anti-aging skin care available without breaking the bank. This kit includes (with large and small kit sizes, respectively): 1) Super C-20 Serum (1 oz/0.25 oz) - A full 20% of this formula is pure, cold-water-processed Vitamin C. As a powerful antioxidant, this nutrient is proven to promote skin health. Especially suited to aging skin, Hale's Super Serum improves the appearance and texture of skin at the cellular level. 2) O.R.A.C. Lifting Complex (2 oz/0.5 oz) - This is an intensive and targeted formula designed specifically to fight aging. 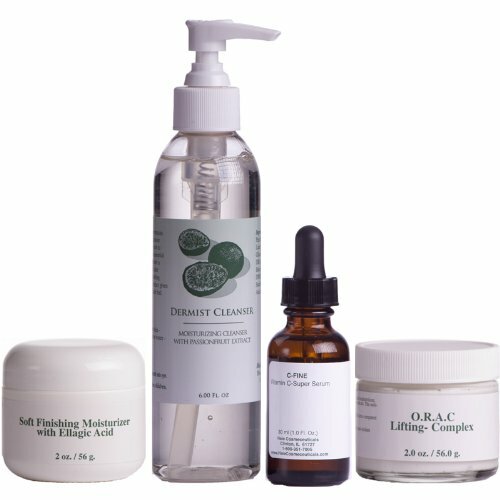 Because free radicals are a significant factor in aging skin, the O.R.A.C. Lifting Complex helps remove Reactive Oxygen Species from your skin's dermal layer, improving skin tone, elasticity and collagen production. The formula also benefits from the addition of both alpha-hydroxy and beta-hydroxy acids. These ingredients moisturize, improve skin tone and fight blemishes. 3) Soft Finishing Moisturizer (2 oz/0.5 oz) - Another product with antioxidant ingredients, the Soft Finish Moisturizer brings the power of ellagic acid to the table. With the prevalent risk factors of both sun and chemical exposure, ellagic acid gives you a layer of protection from cellular damage while also improving collagen production. This antioxidant is paired with kukui nut oil, a rich natural source of skin-friendly lipids that heal sun-damaged skin and fight dry-skin conditions including psoriasis. 4) Dermist Cleanser (6 oz/0.5 oz) - This mild formula removes dirt and bacteria without stripping your skin of nourishing essential oils. The base of polysucrose-derived ingredients cleans effectively without causing redness or irritation, while the passion nut fruit extract offers a refreshing finish that is ideal for daily use. If you have any questions about this product by Hale Cosmeceuticals, contact us by completing and submitting the form below. If you are looking for a specif part number, please include it with your message.